One of the fundamental questions underlying the debate over gay marriage is, quite simply, what is the point for gays to marry. Aside from certain property and legal issues which could, in theory, be solved by other laws, what point are gay persons trying to make in attempting to get married? Why is it so important to be able to hold up a marriage certificate and say “we’re married” instead of simply saying “we’re a couple” without a certificate? Gay marriage advocates argue that this is an equal rights issue. But what is it that a married hetero couple can “do” that an unmarried gay couple cannot “do”? Under current law, gays can commit themselves to one another... they can live together... what can’t they do that married people can do? Nothing, as far as I can tell. So why is it so important for these gay (and lesbian) couples flocking to San Francisco to be able to hold up an “official” marriage certificate after their one-minute wedding? I surmise that it’s about validation: gay and lesbian marriage is about their relationship being recognized precisely as a marriage. But my question is this: why am I being forced to acknowledge gay relationship as marriage? That is, after all, what marriage is: a political (i.e. public, on behalf of the people) stamp of recognition. Hence, my conclusion: in many ways (albeit not for all those involved), gay marriage is about forcing the body-politic to recognize homosexual unions as legitimate. Burgwald is right — and he is wrong, and all on the very same point. He is right that being married is about achieving a sort of validation for a gay couple; he is wrong that there is nothing that a married heterosexual couple can “do” that an unmarried gay couple cannot do — and it is precisely this point of asserting social validation for their relationship. Finally, he is further wrong that he is being forced to acknowledge a gay relationship on a personal level. It is worth noting that there is nothing in these questions about gay marriage which could not be asked about marriage. What is it that a married heterosexual couple can do that any couple living together can’t do — especially if we imagine changing a few contract laws to allow for things like property sharing? What is so important about a marriage certificate that any couple, gay or straight, would want to hold it up? What do they hope to gain by having society acknowledge their relationship as a marriage? What is Marriage, Gay or Straight? Taking Chris’ first two points together, we can address them by taking a look at just what marriage is in the first place. Setting aside all of the loaded arguments about raising children and heterosexual relationships, the most fundamental characteristic of civil marriage which differentiates it from other contractual relationships is the fact that it establishes, legally, socially, and morally, a new kinship — and by extension, a new family. A group of people can sign a contract for the purpose of setting up a new business, but they don’t thereby become kin or family. Two people can sign a contract assigning one the legal authority to make medical decisions for the other, but they don’t thereby become kin or family. Two people can sign a contract to share property jointly, but they don’t thereby become kin or a family. When two people marry, however, they do become kin — they are now related to each other. Furthermore, they also establish kinship ties with one another’s families — and in some cultures, establishing kinship ties between the two families has been regarded as the purpose of marriage, not establishing kinship ties between the two people getting married. All of this is makes marriage fairly unique among all other sorts of contracts that can exist in society — only adoption is at all similar. In fact, this is the one characteristic of marriage which seems to be common to all forms of marriage in all cultures and societies through time. The only natural kinship ties are biological, and the only obvious biological kinship which exists is that between a mother and her children. All other kinship ties are established through culture — even fatherhood, which is often as much a matter of social convention as it is assumed biological paternity. Kinship and familial relationships create the smallest social units of any society. The importance of kinship as a means for structuring relationships and behavior is evinced in the way societies have had so many systems (formal and informal) for establishing pseudo-kinship between people who have no biological relationship and for whom there are no means for creating traditional kinship ties. Common examples of this are the informal ways people refer to one another as “uncle” or “son” regardless of actual familial ties, the prevalence of “blood brotherhood” ceremonies in various groups, and ritual kinship bonds created by different social groups. Kinship is an important thread in the social fabric. It isn’t an “institution” like marriage because there are no specific legal, religious, or social rules regulating it. Kinship is, instead, an amorphous creation of many other institutions which help people structure their relationships with one another. Marriage establishes a relationship which does not and cannot exist for people who are simply living together. However much a cohabiting couple may love each other, and however long they may have been together, their relationship is not such that it can be described as “kin” and, as a consequence, they cannot make any legal, social, or moral claims on others to treat them individually and jointly as if they were kin. There are many situations where kinship creates bonds and obligations not otherwise available to people. Commonly cited is the example of a person who has been in a serious accident and who needs someone to make major medical decisions for them — perhaps even the decision to take them off life support. Whom do the doctors wish to speak to? The next of kin. If married, the “next of kin” is always the spouse, and if that person is not available, the doctors move through children, parents, and siblings. Gay activists often use a situation like this to point out the injustice done to gay couples who cannot marry, but I wanted to bring it up in order to ask you to take a fresh look at it. Why is the “next of kin” the spouse? After all, doesn’t a person have a stronger biological relationship with parents or children? Yes, but a stronger biological relationship isn’t the same as a stronger kinship relationship. The relationship with a spouse is often treated as more important because it is a chosen relationship. You can’t choose your parents or children, but you can choose your spouse — the person you wish to spend your life with, share all levels of intimacy with, and establish a family with. Heterosexual couples have the option to establish kinship with one another by marrying. Homosexual couples, whose love and intimacy cannot be judged as any less valuable or significant than those of straight people, do not have this option: they cannot form a kinship bond with one another. Because of this, their relationships are at a social disadvantage. There is, after all, much more to being “kin” than the legal benefits like what I describe above. To begin with, there exist important moral obligations kin owe one another. These obligations may be enforced legally, as in some cases with marriage, but very often they are informal and unspoken yet nevertheless supported by one’s social milieu. Kin are expected to, wherever possible, financially and emotionally support one another when a crisis hits. A man who lets his mother become homeless will be ostracized by those around him, while siblings are expected to support one another when there is a death in the family. The flip side of this are the obligations which the rest of the community owes to those who are tied together through kinship bonds. People who are kin are not supposed to be treated as if they were complete strangers to one another. If you invite a married man to a party, it is expected that the invitation is also extended to his wife — to deliberately exclude her would be a serious insult which would not exist if you invited one roommate but not the other. When a woman’s son achieves some success, you congratulate her as well — you wouldn’t act as though she had no significant connection to him. To return to the points made by Chris Burgwald, but which are certainly made in various ways by many others who argue against gay marriage: is there any social and moral significance to the marriage certificate which goes above and beyond merely living together and which gay couples are justified in desiring for themselves? Absolutely — just like there is social and moral significance to marriage which straight couples are justified in desiring for themselves. There should be no puzzlement over a gay couple, whose love and relationship may be every bit as deep and enduring as a those of a straight couple, would want to become recognized as kin, thus creating a new relationship and new ties not otherwise available. There is also no surprise that many gay couples have chosen to have one “adopt” the other, which is the only way such a bond is even remotely available to them outside of marriage. But what about Chris’ final question, “why am I being forced to acknowledge a gay relationship as a marriage?” As a private citizen, he would be under no such obligation — at least not legally. He would be under no more obligation to acknowledge the marriage between two men or two women than he would be to acknowledge any other marriage — the marriage of a Catholic and a Jew, the marriage of a white woman and a black man, the marriage of an 60-year-old and an 18-year-old, or my own marriage for that matter. 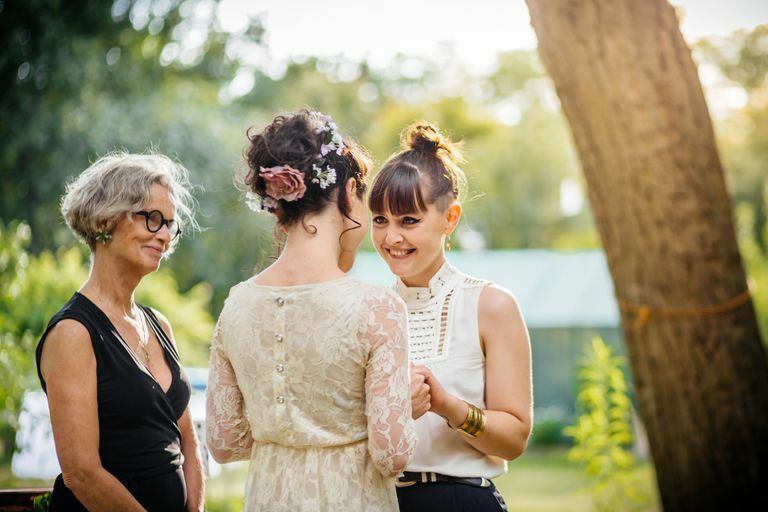 There will be social pressures to acknowledge gay unions as marriages, however, just as there are social pressures to acknowledge the other listed relationships as marriages. When a person acts as though a spouse is little more than a random stranger, that will normally be perceived as an insult — and with good reason. But if Chris Burgwald or anyone else chooses to act in such a fashion, they will be as free to do so with gay marriages as they are to do so with other marriages today. In summary, what’s the point of gay marriage? The point of gay marriage is the point of all marriage. Marriage is different from other contractual relationships because it creates bonds of kinship. These bonds are in turn different and more important than other bonds: they create significant moral, social, and legal obligations both for those who are married and between those who are married and everyone else. Some individuals may not choose to acknowledge those obligations, but they exist, and they constitute the basis of human society — a society which includes both heterosexual and homosexual human beings. Can Gay Rights and Gay Marriage Be Stopped? Argument From Justice: Must Justice Exist in the Afterlife?